It was raining when the ferry reached Stornoway. 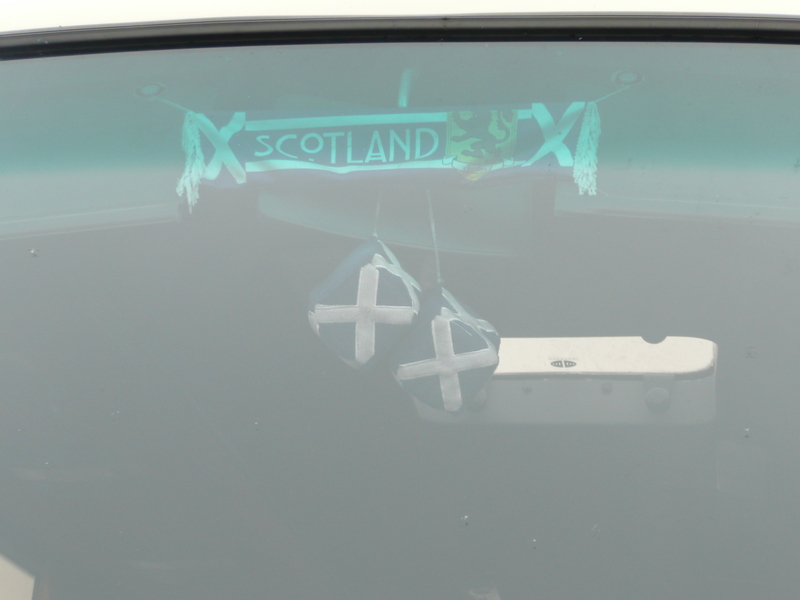 It’s Scotland, I didn’t expect any different. Grace was swathed in tincloth, I was likewise. 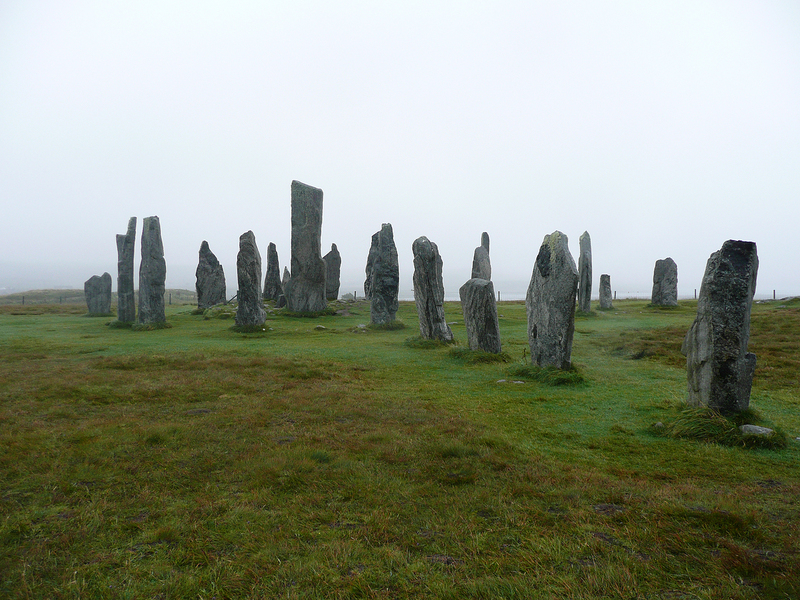 I didn’t have a hostel reservation, because I’d planned on going straight to the stones, and then to Tarbert to catch the morning ferry to Uig. I expected the hostel in Tarbert to be a bit of an adventure. It was also a fairly important link in the trip. There are two ferries per day to Uig. One at 7 AM, the other in the late afternoon. The problem is, getting hold of the proprietors of the place is a real challenge. Every email address I was able to locate bounced, and the review I found online had a very entertaining story, the upshot of which was, call them a day or two in advance and if all else fails, knock on the door. You may or may not get in. I’d gotten hold of the owners the night before in Inverness and they’d informed me that the place was closed. When the ferry docked, I headed straight to the Heb Hostel, the only one listed for Stornoway. It was full, but the person who answered the door was friendly and told me that there was another hostel in town, as well as the location of the tourist information center. I couldn’t find the hostel from the directions, so that was the next stop. Every tourist information center I visited in Scotland was beyond helpful.They knew where almost everything was, and what they didn’t know they were pretty efficient at locating. They sold great maps, along with souvenirs ranging from truly tacky to downright beautiful. The woman behind the counter was helping another traveler in the same predicament I was in, and by the time she was done I’d seen everything in the shop several times over. Good service takes a bit of time and I was on vacation after all. I was soon on my way with a map marked with the spot. The hostel was not marked, the door was locked and the phone number on the door wasn’t being answered, but eventually one of us got in, and the few of us with patience followed. The proprietress had had no cell service in the Tesco’s. The hostel still has no name, at least not one I know, but it was almost the best place I stayed on the entire trip. It was brand new, and run by a couple. I only saw him for a minute or two, but she was the spirit of hospitality. She started by giving us all free run of the kitchen. There was a fridge stocked with food, proper pots and pans, and best of all, tea and sugar. The wi fi only worked in the kitchen as it turned out, but the kitchen was the heart of the hostel. Later in the evening, I came back to find her in her PJs doing the family dishes. It was their main kitchen as well. She found out I hadn’t eaten yet in the course of our conversation, by then we’d both come out of the broom closet, so to speak and she offered to cook me dinner, which I would not allow. She was on her way to bed, the kitchen was full of food, and I was feeling better cared for than I had since Anderida camp. If I ever go back to Stornoway, that place will be my first stop if it still exists. Stornoway, by the way, is a really nice town, big enough to be interesting, small enough to be friendly. But you were expecting to hear about Calanais, right? You’re about to, but you can’t separate the place from the people and the people of Lewis were wondrous indeed. I’d missed the last bus to the stones finding a place to sleep, so I got on the first bus in the morning with a fellow traveler from the hostel. The ride was misty and wonderful. The visitor center was still closed so we went straight to the stones. The mist got thicker the longer we stayed, and quite soon I had the place to myself in a light rain that only made the weight of ages close in further. The quiet was immense. It was more than just the usual quiet misty rain brings. The gray of the sky set off the gray of the stones, and the green of the grass, just as it does in my home on the shores of the Western Sea. It was so similar, yet so different. There were no trees, but the green of the moss and of the grass more than made up for it. I could see the shape of the land to where it disappeared into mist, and the bare bones of the rocks where they broke through on the hilltops. The rain ran off my duster and my sou’wester, its soft dripping the only sound there was, or could be. I walked slowly around the perimeter of the stones, and set my back against the farthest one, where I was sheltered from the wind and could look up the long avenue of irregular rocks. 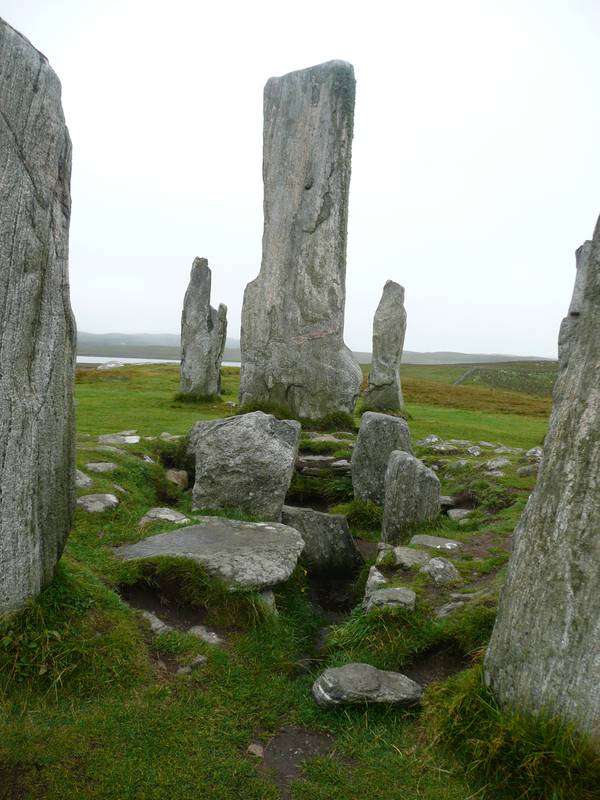 No, the stones didn’t speak to me, not as such, but the quiet slowly seeped into me and I came to know that we humans didn’t know any more what these stones had meant to the people who raised them, and we didn’t need to. The keys to this place have been lost, at least for now. It really doesn’t matter because it served its purpose for the people who built it, and it is impressive enough to us to make us act to preserve it. Like any great work of art, its existence is enough. 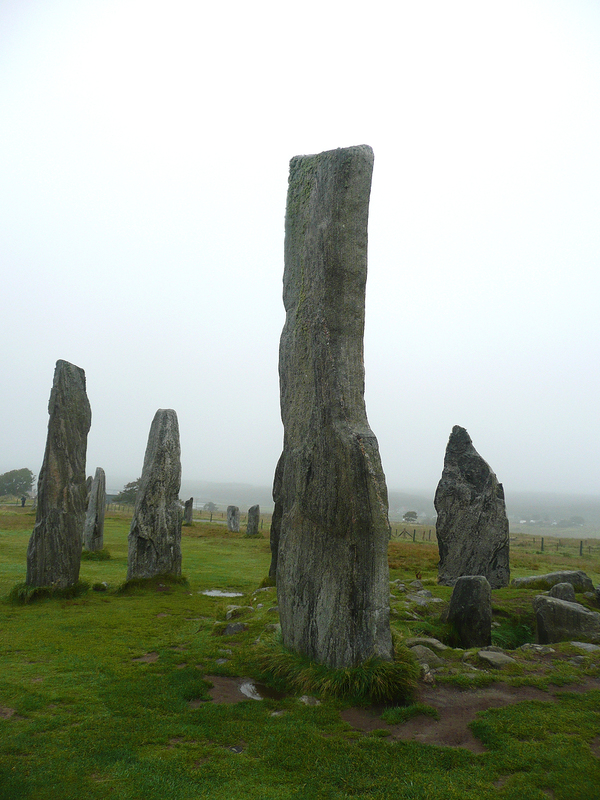 Eventually I walked up the avenue and into the stones. I felt as if I had all the time in the world, and for that moment, I did. I sang the song I had brought to the stones. Giant, by Stan Rogers. I did it without the drum, there wasn’t a snowball’s chance in hell it would have been playable in that weather. It didn’t matter, all that was necessary was that I did it. 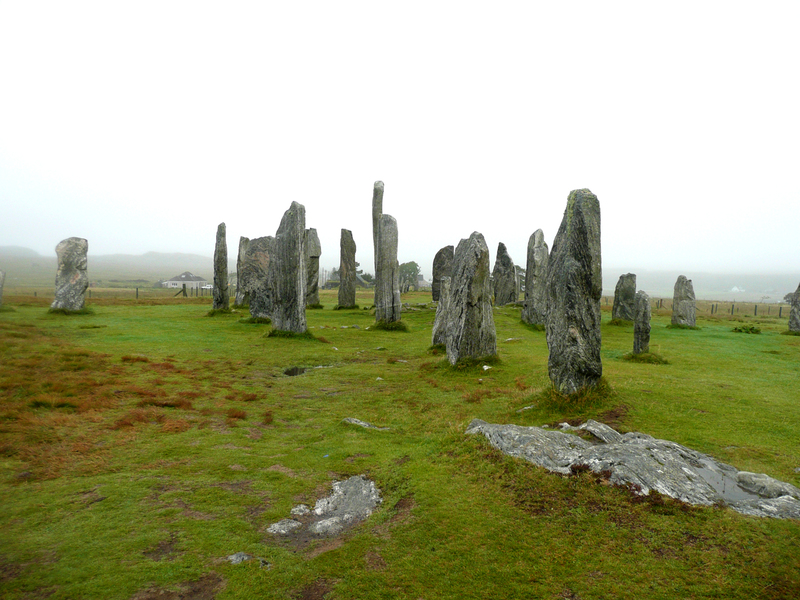 By then, the rain had stopped and people were beginning to filter back up to the stones. When a large tour group showed up, I went down to the visitor center and learned enough to make me very curious about what was going on in Britain and Ireland 5,000 years ago. These people were not Celts, though their blood of course runs in our veins still. They seem to have done things in a much more egalitarian way, as perhaps the people of Stonehenge did too, in the same period. There’s a very interesting Nova episode that can be watched online about the alignment of Stonehenge with the solstices, and another nearby site called Durrington Walls. 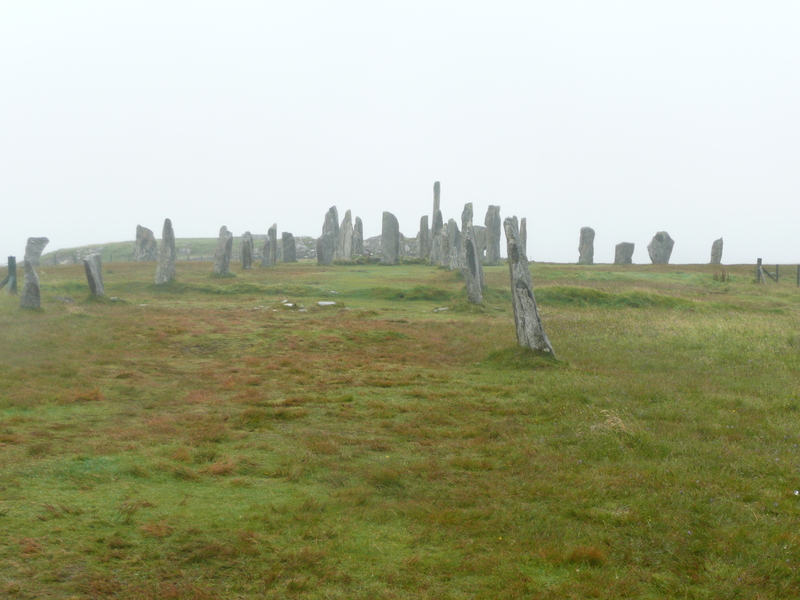 Calanais may have had a lunar alignment. This strand properly should lead through Newgrange as well, the same immensity of time draws those places together for me, but I will give that tale its own space.